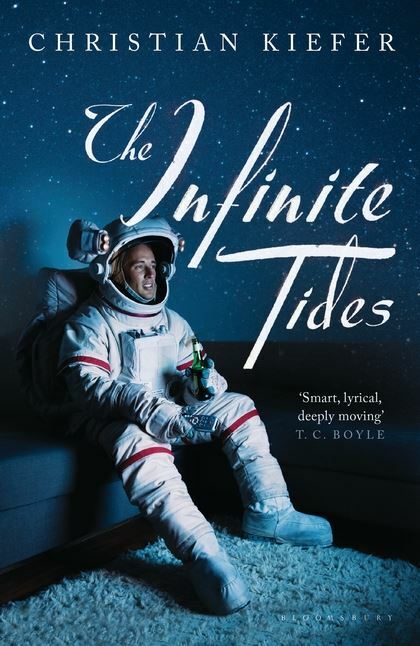 Infinite Tides is Christian Kiefer’s first publication from a new imprint of Bloomsbury Publishing, Bloomsbury Circus. Keith Corcoran is a man of numbers, equations and solutions. As a kid growing up, friends, parties and social occasions meant nothing to him as he already knew what he wanted to achieve. Keither Corcoron was meant to be an astronaut and never considered any other option because to him, there wasn’t one. During his first ever mission into space, he’s given the life-shattering news that his daughter has died in a car accident. His wife pleads for him to come home and when their message connection is severed, he rejects the offer to be reconnected. He hurls himself into his work, hiding in the numbers he understands so well but when he’s bedridden with head-splitting migraines, even his work can’t help him. Mission control do their best to get him home but due to numerous problems, it’s over three months until he’s actually back in his family home. The house that used to hold his wife and daughter now contain neither, his daughter long buried and his wife leaving him, admitting to cheating on him and cleaning out the house. Left with only a bed, a giant sofa and a few bits of chipped crockery, he’s sent home by NASA to get some rest and recover. To Keith it’s as good as being fired, he presumes they’re pushing him out and won’t ever have him back. With his family gone, his work rejecting him, his colleagues avoiding him and living in a house instead of a home, Keith needs to figure out if numbers give him enough of a purpose to survive. The first thing to strike me about this novel is how incredibly wordy it is when it comes to descriptions and actions but partnered with a complete lack of emotion. This is a characteristic of the main character of Keith but at 470 pages long, this is a lengthy book that really didn’t command my attention for the first 400 pages. The interactions with his wife while he is in space are evocative but do not play a huge part and therefore left me appreciating the beautiful writing style but not inspired enough by the main character to feel compelled to want to pick the book up again. Keith’s interactions with other characters improve towards the end of the novel and this does help to draw you in. Then to completely throw me, the last seventy pages seemed to encapsulate everything the author has been trying to convey in a perfect way that I just couldn’t have adored more. If this book had been half the length, it would possibly be one of the most moving pieces of fiction I have ever read. Then again, it would be hard to say that the finale would have had a similar impact with less coming before it. Either way, this isn’t an easy read as it is ultimately a story of surviving loss but the ending is intense, intelligent and beautifully moving.